Always walk in style with Mens Slide Sandals with Velcro Strap that protect your feet and allow you to stroll carelessly and casually. Having a contrasting EVA Sock that not only yields high-energy return but also ensures excellent support for lasting comfort, these sandals have an embossed comfort footbed that conforms to the arch of the foot. Designed from high-quality plastic, the high-performance sandals feature a molded injected outsole for superior traction and stability over uneven and tricky terrains. 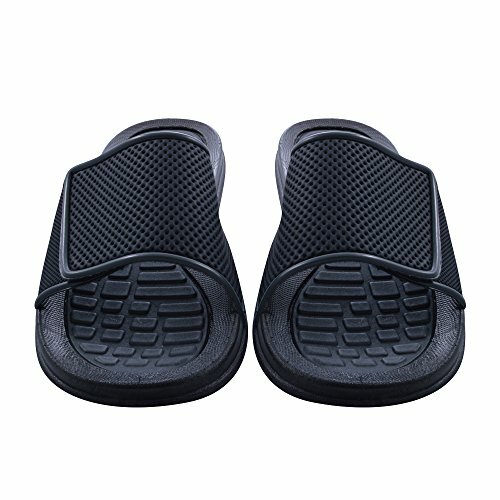 These slide sandals have a Velcro strap upper that is adjustable and provides a customized fit. RUGGED: Made of high-quality plastic, the sandals are sturdy and ideal for rugged use. VELCRO STRAP: The Velcro strap upper of the sandals ensure an adjustable and customized fit. EMBOSSED COMFORT FOOTBED: The embossed footbed of the sandals is ideal for prolonged wear. CONTRASTING EVA SOCK: The contrasting EVA sock offers excellent support and energy return. If you have any questions about this product by Skysole, contact us by completing and submitting the form below. If you are looking for a specif part number, please include it with your message.